Iranian media outlet cited Ali Asghar Mounesan, the Iranian vice president and head of Iran's Cultural Heritage, Handicrafts and Tourism Organization (ICHTO), who announced that passports of foreign tourists visiting Iran will not have to be stamped. Proposed legislation for the move has been drafted and approved by the head of ICHTO and main the country's Ministries. 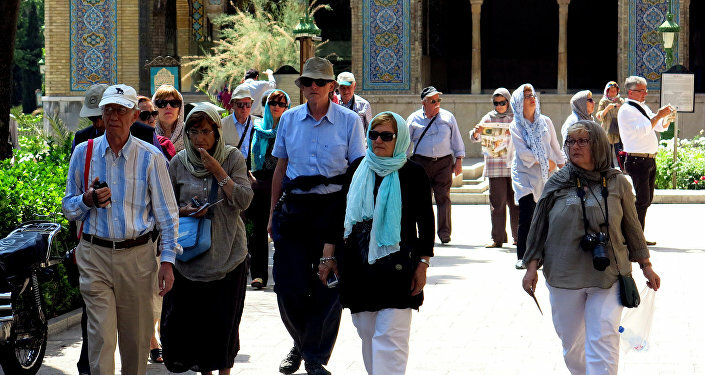 "While the statistics provided by immigration police of Iran show that the number of foreign tourists visiting Iran has increased by 38 percent in the first four months [of the current Iranian year of 1397], the number of European visitors show a slight decline which has affected the functionality of our 4- and 5-star hotels," Ali Asghar Mounesan was quoted as saying by Mehr news agency. Mounesan stressed that the move will allow an easing of "tourists' concerns about visiting Iran because of US sanctions." Last year, Russia and Iran signed an agreement on visa-free travel for tourist groups from five to 50 people. Moscow and Tehran have simplified visa rules in place for their nationals – business people, scientists, educators and several other categories of travelers – that has been in force since February 2016. The resumption of sanctions against Iran by the administration of US President Donald Trump began in May when the US withdrew from the 2015 Joint Comprehensive Plan of Action (JCPOA), more commonly known as the Iran nuclear agreement. On August 7, Trump imposed the first package of sanctions against Iran, targeting the country's purchase of US dollar banknotes, trade in gold and other metals, as well as transactions involving its national currency. A second package is set to be introduced by Trump on November 4 that, among other things, aims to hit Iran's energy sector and oil exports. On Monday, Iran Supreme Leader Ayatollah Seyed Ali Khamenei ruled out the possibility of either waging a war or engaging in negotiations with Trump amid escalated Tehran-Washington tensions. Tehran has noted that in order to pave the way for talks with Iran, the Trump administration must return to the JCPOA Iran nuclear deal. Other signatories to the JCPOA, including China, France, Russia, the United Kingdom, Germany, and the European Union, have agreed that the historic agreement must be preserved.